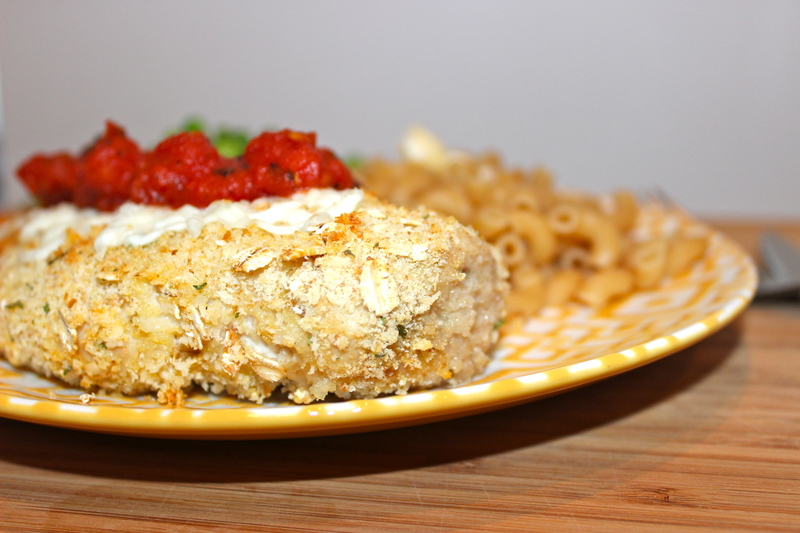 When I was growing up, chicken parmigiana used to be my favorite dish. I honestly ordered it whenever we would go out for Italian food. I don’t eat it very often now–or ever really– because at restaurants it always seems to be deep fried and calorie loaded. Fried food and I aren’t friends (unless it’s french fries a few times a year–they are my fried food weakness). Anyhow, Matt was having a severe craving for chicken parm, so I decided to make it healthier by baking it in the oven and serving it with whole grain pasta. I breaded the chicken with whole grain seasoned bread crumbs, old fashioned oats, and a few hefty tablespoons of really crunchy Japanese panko breadcrumbs. The end result was so crispy it was a really great mimic for fried chicken but without all the calories. I’d like to try this coating again for chicken tenders because I think that those will even get crispier. I had never added old fashioned oats to a breading before but it was without a doubt, my favorite part of the breading. The longest part of this meal was waiting for the chicken to cook in the oven–I had enough time to unload some groceries and do the dishes. The only thing I think I’d change about this recipe is that next time I’ll pound the chicken breasts out into thinner pieces as I prefer my chicken to be thinner for whatever reason (I normally always do this but tonight forgot I guess). This recipe is super easy to make and will be ready from start to finish in less than 30 minutes. Some days it is really hard to get the recommended daily allowance of fruits and veggies in your diet. 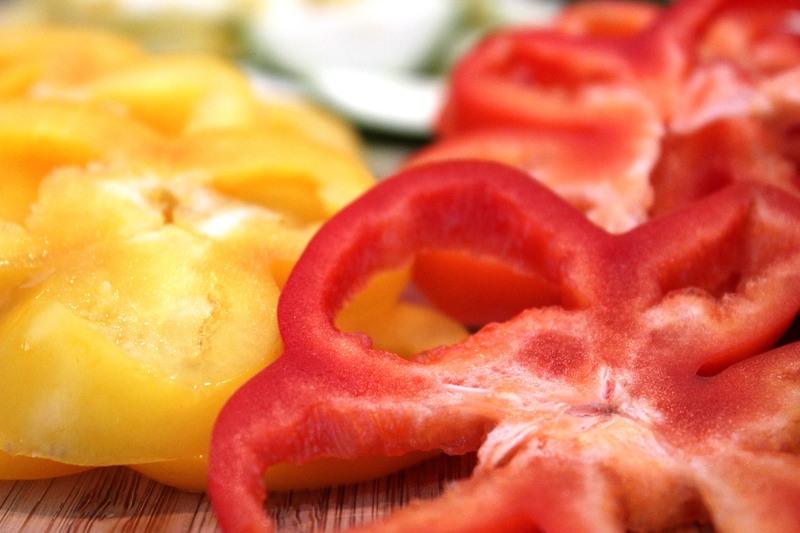 An easy way to make sure you are getting a few extra servings is by using your juicer. The great thing about juicing is that if you always use carrots and apples as your base, despite adding spinach or other hearty greens, it still retains a sweet flavor. Plus you know that there are no additives–you are only consuming fresh fruits and veggies not sugar filled juice cocktails. It is also said that juicing allows you to digest the produce more readily so your body is making the most of the nutrients–but there is a draw back to juicing. Juicing doesn’t provide a high amount of digestible fiber like just eating a piece of fruit with edible skin does (fruits are most fiber rich with the skins left intact–that’s when it is important to get your fiber from a different source too–from beans, corn, whole wheat pasta, brown rice etc). It’s important to only juice as much as you are going to drink in one setting because fresh juice doesn’t store well (no preservatives = gross bacteria growth). Great juicers are really coming down in price too, so they are a great gadget to add to your kitchen. I absolutely love my juicer and love the fact that I’ve never had the same juice twice. 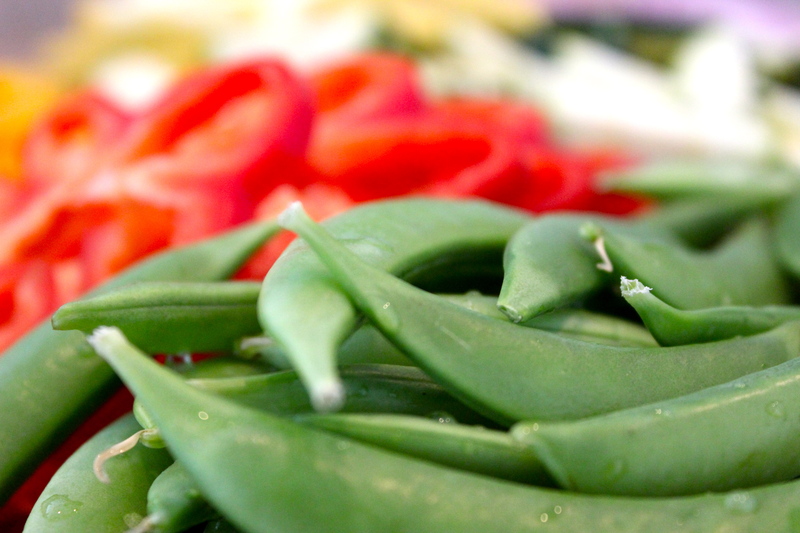 I often just gather whatever produce I have in the fridge and give them a try. Today I had an apple, 3/4 cup of carrots, a kiwi, 3 ripe plums, 1/4 cup of green grapes, and 1/2 cup of strawberries. I usually toss in a handful of spinach or some fresh ginger but I didn’t have any of that on hand today. 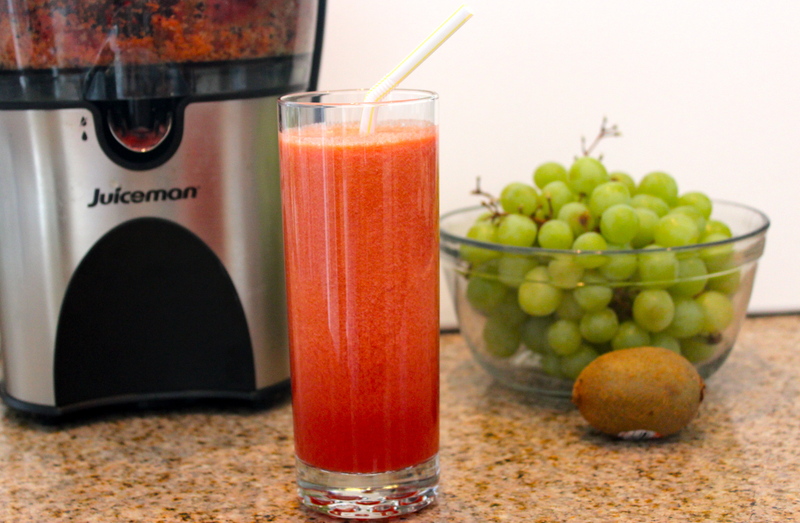 I really enjoyed today’s combo though–I had never juiced plums before (remove the pits obviously) and I loved the flavor and color it added to my juice. There’s no real recipe–it’s pretty much trial and error to find what you like. I often incorporate cucumber into my juicing combinations too, which is really light and refreshing. Adding carrots gives you a lot of great health benefits (vitamin A and antioxidants) and also keeps the cost of juicing down. Enjoy! Matt and I were craving Thai food but we didn’t want to chance missing the opening ceremonies for the Olympics. I have never tried cooking Thai but with Whole Foods only a half mile away, I knew that we would be able to get the necessary ingredients in a hurry. 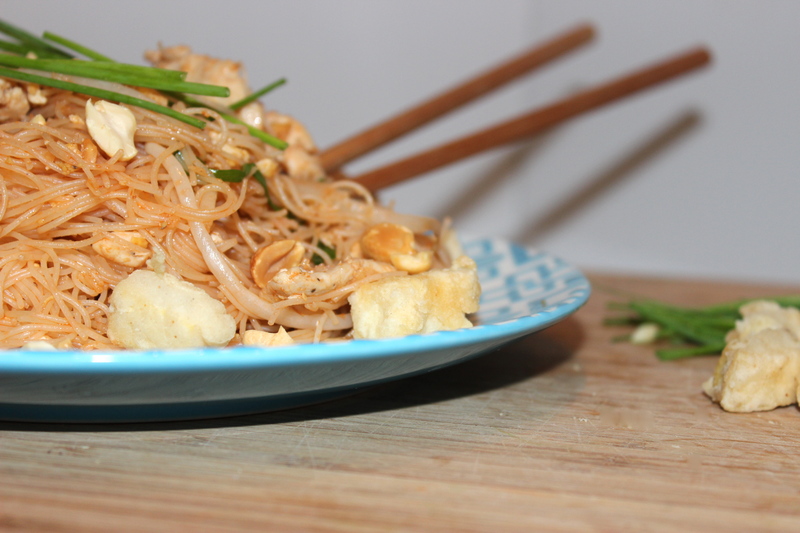 I am so happy I gave this recipe a shot–as squeamish as I was to try fish sauce (knowingly! I always try to pretend it’s not in my food when we dine at Authentic Thai places ha! ), I am really glad I decided not to omit it. 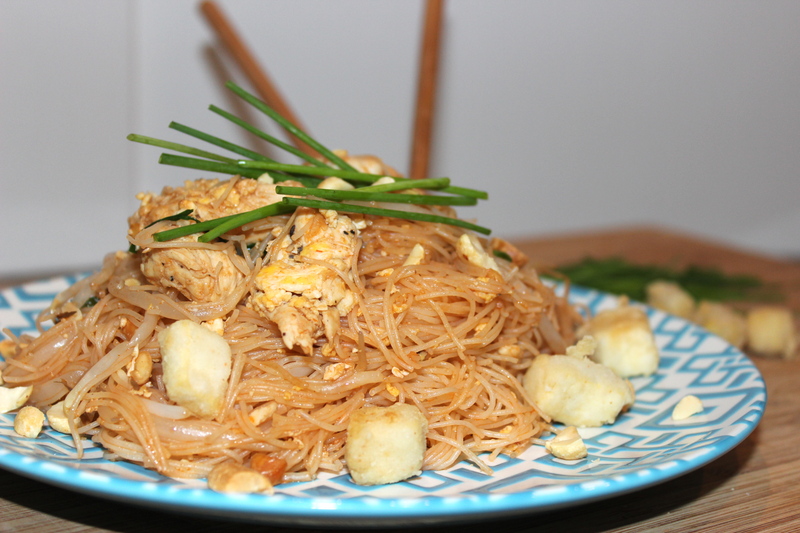 I substituted Whole Grain rice noodles in place of regular noodles to make it healthier. 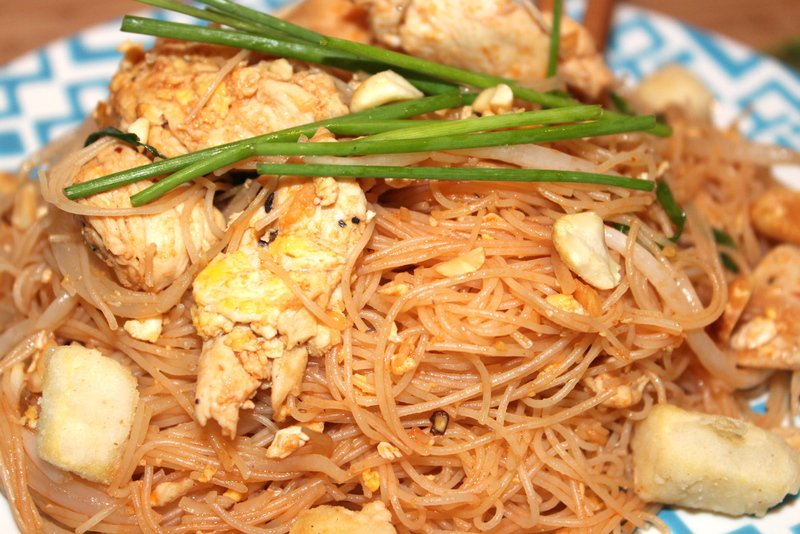 I also added Tofu to the recipe because it’s totally my favorite part of Chicken Pad Thai when we dine out. I lightly dusted the Tofu chunks in flour, corn starch, and salt + pepper. I put a few tablespoons of canola oil in a shallow pan and lightly fried the pieces. 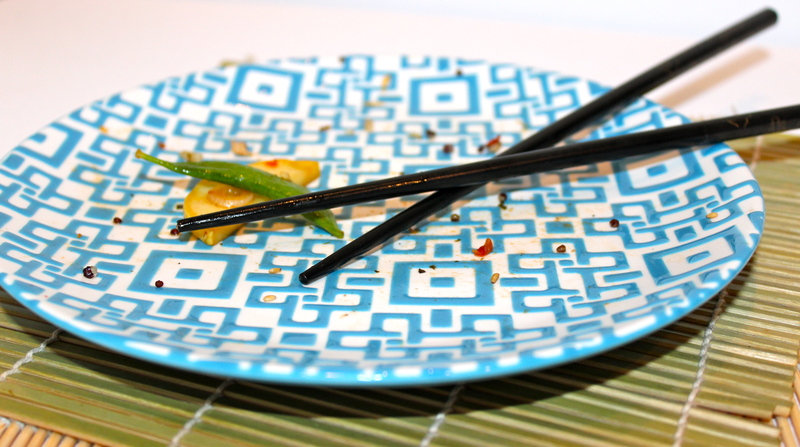 They were really crispy and delicious–plus they added an extra punch of protein to the dish. This recipe is also very vegetarian friendly too–just substitute the chicken for Tofu. I also know they sell Vegan friendly fish sauce at speciality markets. 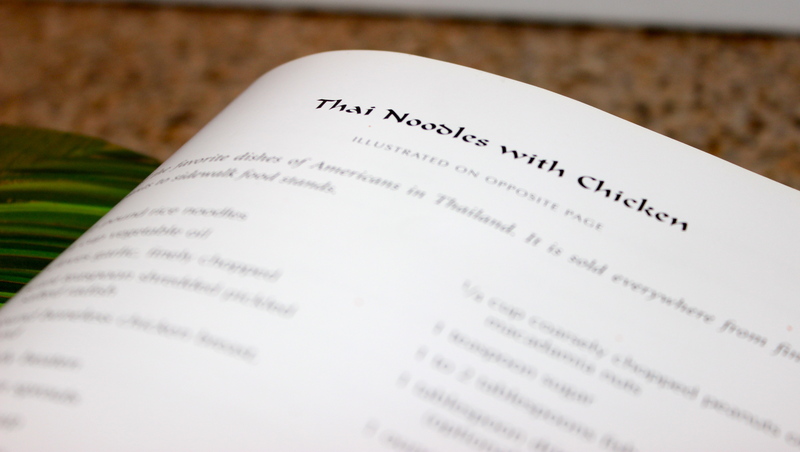 I’ve owned this cookbook for a couple of years and this is the first time I’ve cooked from it–I look forward to trying a few more recipes in the future. I hope you enjoy it! The first time I ever tried Molten Chocolate Lava Cake was when Matt and I were celebrating our engagement at Fleming’s restaurant in 2010. I was determined to figure out how to make it because it was so freaking good. I have found a delicious recipe that is sure to please everyone (plus it’s super easy to make! Most of the work is done in the microwave!). 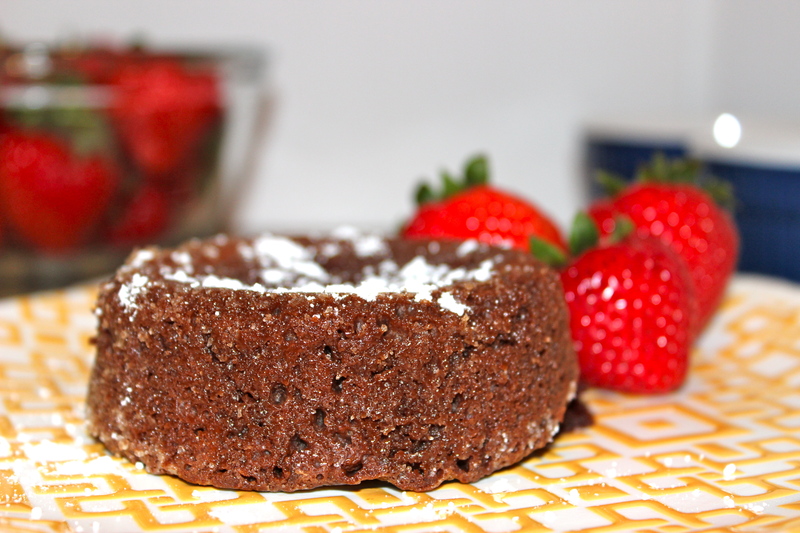 If you’ve never had Molten Chocolate Lava Cake you are definitely in for a treat. It’s like a warm, chocolately, gooey doughnut like cake. It’s pure amazingness. I’ve made a few minor additions to the recipe that I feel make something fantastic even more delicious. 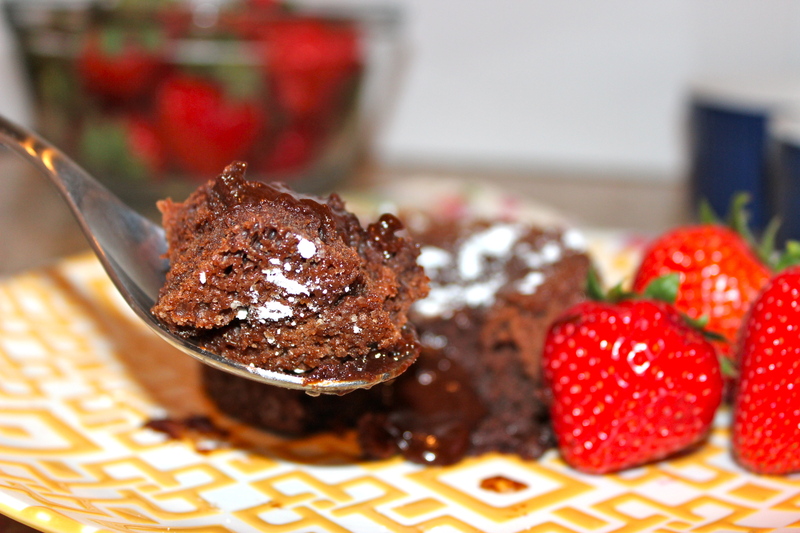 I usually serve my Lava Cakes with a small scoop of ice cream, fresh fruit, and a little whipped cream. Cooking time varies a little bit depending on what sized ramekins you decide to use. I’ve made 6 smaller ones and 4 larger ones–just keep an eye on the cakes the last few minutes of the cooking time to make sure you don’t over cook them. They should be soft in the center but set on the outside (slightly pulling away from the ramekin). 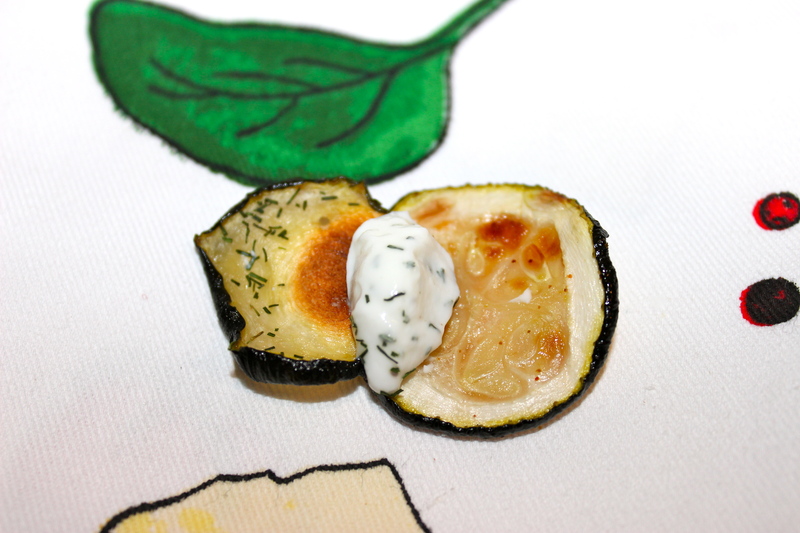 To invert them on a plate–let them cool slightly put plate on top of ramekin and invert both together. Lightly tap on the bottom of the ramekin and the cake will fall right out (of course make sure to liberally spray each ramekin with cooking spray!). Enjoy! Light and airy. They are sooo good. mmmmm. look at all the delicious gooeyness. Cooking on the grill is probably one of my favorite cooking methods. I think food just tastes better fresh of the grill.Unfortunately, now that we live in the City we are unable to have a grill because we have no where to store or use it in our apartment complex. It’s a terrible thing really. I honestly used to grill year round–I would freeze in the winter on our patio area usually once or twice a week because I love grilled food that much. 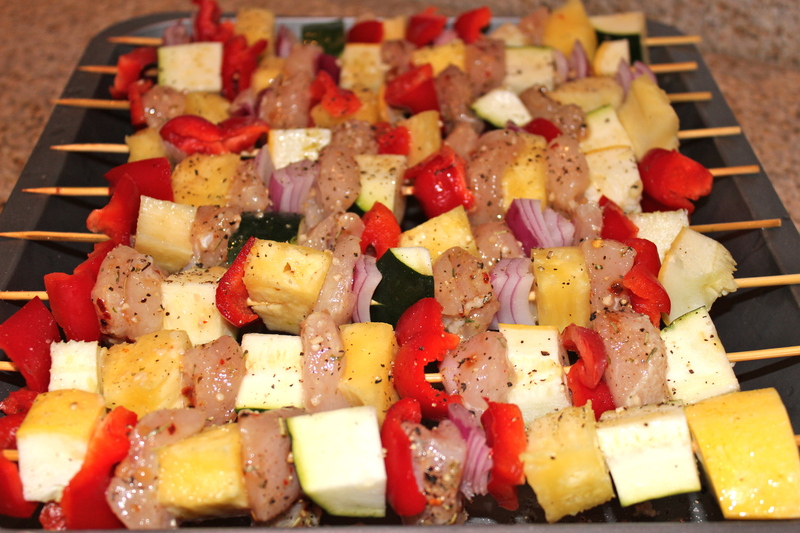 Anyhow, now in order to eat some of our summertime favorites, I’ve had to get a little bit creative in the approach. Matt loves skewers so I have been baking them in the oven for the past year or so. They come out really well and allows us to enjoy them year round. It is definitely a light, easy meal to throw together. 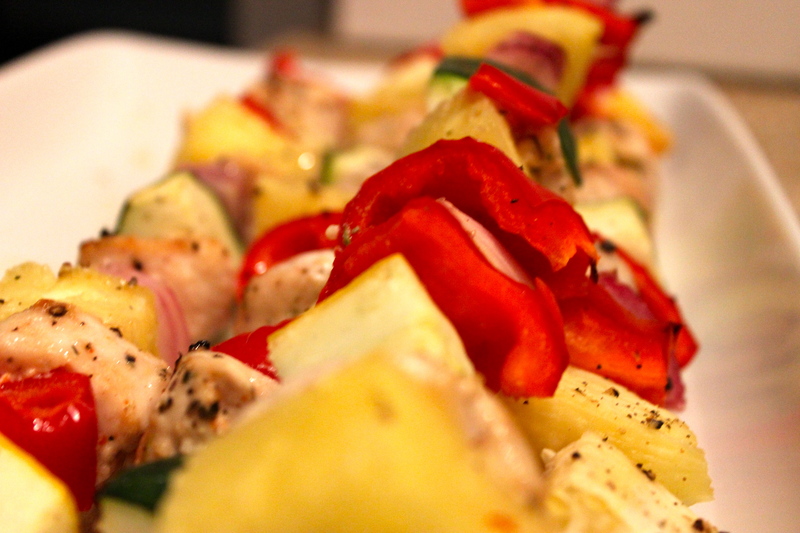 I call this my Hawaiian version of skewers because I marinate the chicken in citrus juice with a bunch of dried herbs, as well as add pineapple to the skewers. I think taking the time to marinate the chicken, even if you can only do it for 20 minutes, really improves the flavors. If you’re lucky enough to have a grill, this recipe will obviously work great for grilling out too (I’m wicked jealous if this is the case!). 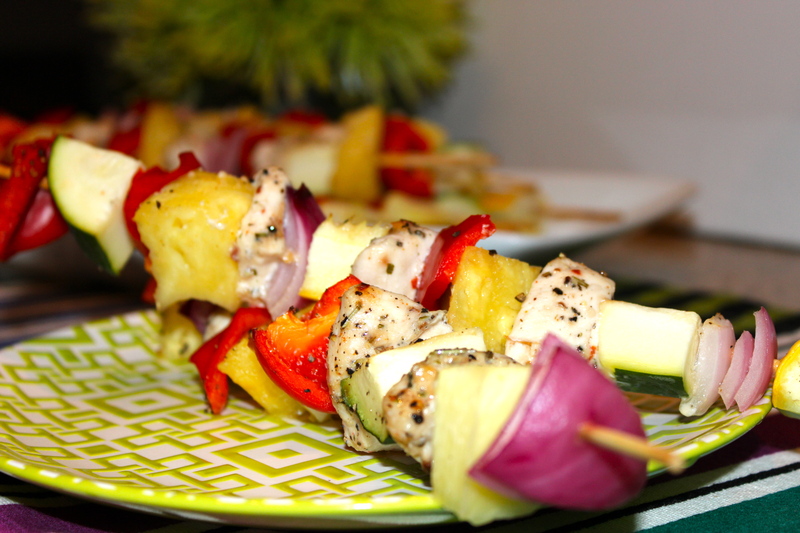 Skewers are great for entertaining and you can even have your guests help you put them together, so each person is able to customize their skewers according to their taste. 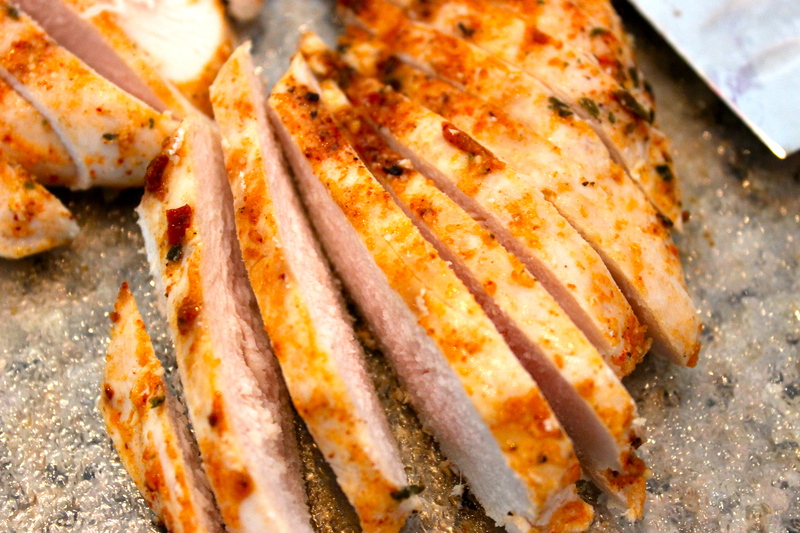 If you are able to grill out over the weekend, you should give this recipe a try! Enjoy. Barbuzzo may be one of my favorite places in the city to get dessert. 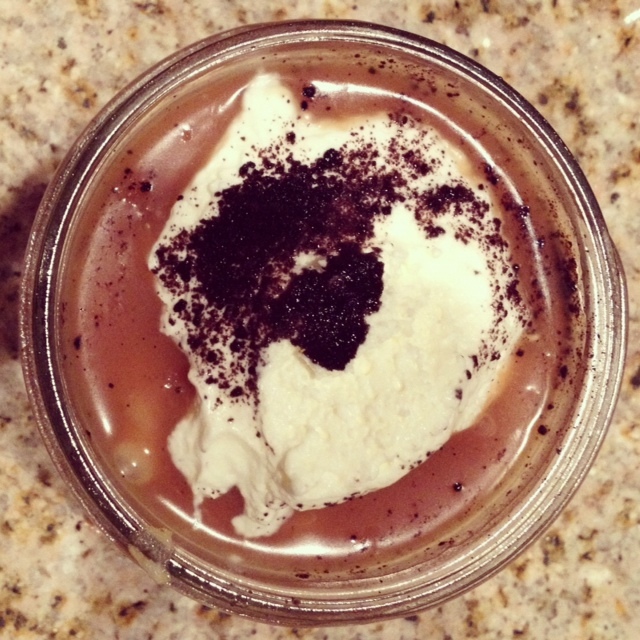 Their Salted Caramel Budino is quite possibly one of the best desserts I have ever tasted…and it’s only 8 bucks. Fabulous. I will mention it’s accolades–it has won the Best Dessert of Philadelphia a few times and it is worth every single calorie. I would love to create a recipe to try and recreate this at home–but for the first time ever, I’m not even sure where to start. It’s the perfect balance of sweetness, creaminess, and saltiness. I guess I need to get in the kitchen ASAP and try and figure this out. I would love to have a recipe this delicious in my repertoire. Anyhow, it’s the addition of the salt that really makes this dessert shine. It’s hard to describe just how great it is in its entirety and I’m not certain I can do it justice by just describing it. I think you all need to come to Philadelphia and try it yourself. I’m serious, if you find yourself here just for a day come order it to go—it comes in it’s own adorable mason jar. 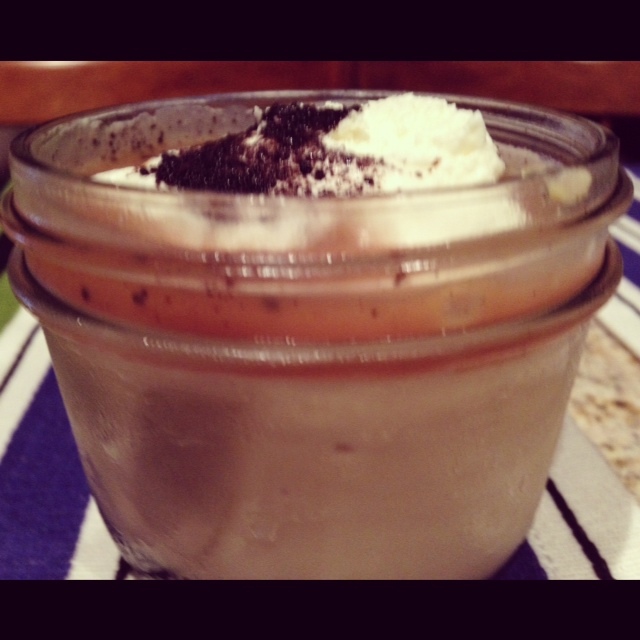 If I haven’t gushed enough about how delicious this dessert is–I’ll say it one more time…it is fantastic. If you do find yourself in the Center City area definitely give it a try and let me know what you think! Matt and I went out to a Greek restaurant in Philly last Saturday called Opa. It is newly renovated with a pretty cool scene. The specialty cocktails were pretty tasty but my favorite thing about the meal were the zucchini chips served with a tzatziki dipping sauce. Their version was fried but I knew I would be able to come up with something just as tasty without all the calories. 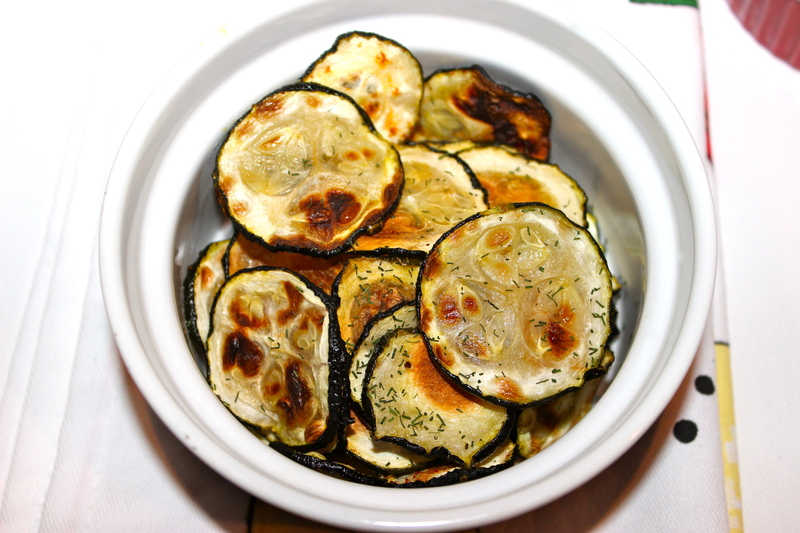 I decided to try baking my zucchini and they came out really delicious. I will say that they are quite time consuming because it takes awhile for the veggies to crisp…but they are definitely worth the wait. 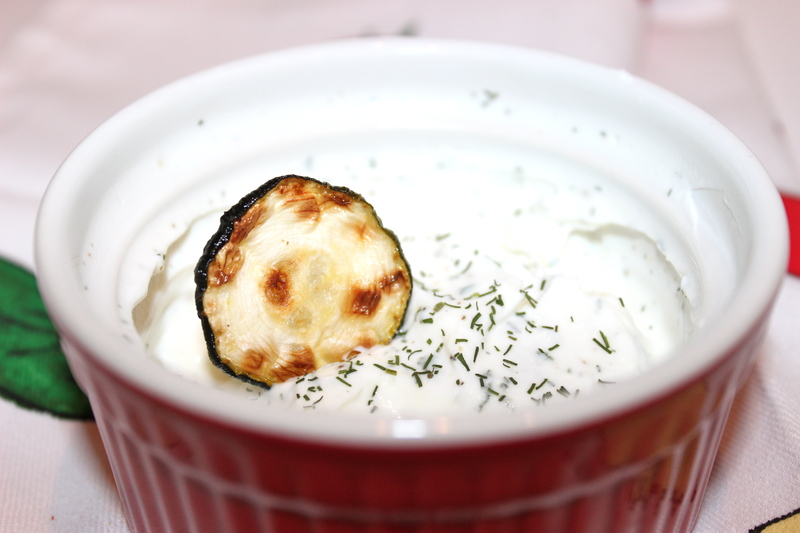 In place of the tzatziki I made my dipping sauce with Greek yogurt and a few other flavors. I tried two cooking methods: placing the zucchini right on the baking sheet and placing the zucchini on a baking rack. I will say that I think that just placing them on the baking sheet worked better. Maybe if I were to set the oven to a higher temperature the baking rack would come in handy to make sure heat was able to surround all sides of them before they burn. Perhaps next time I’ll test my theory and update you all with any new results. Anyhow, I think they are definitely worth a try! They should be eaten the same day they are baked–or else they lose their crispiness and will need to be thrown back into the oven. It’s really no problem to finish them though. I used 2 large zucchinis and it yielded about 1 cup of chips. 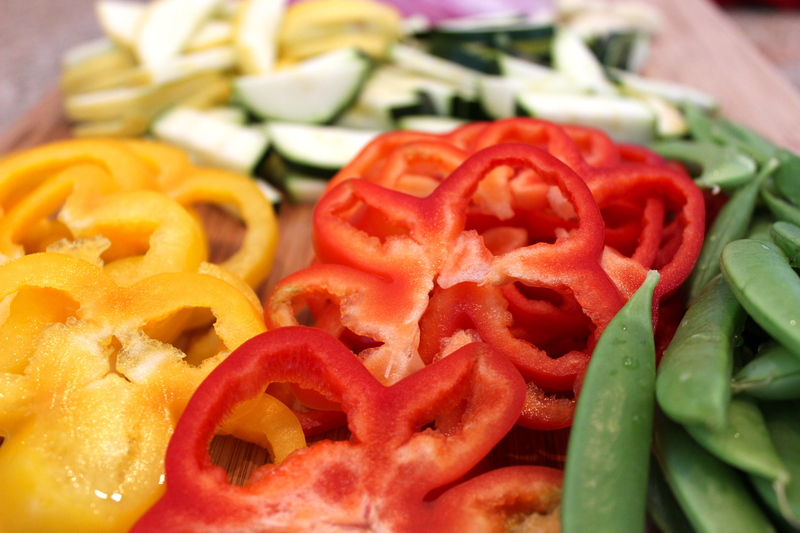 It’s not a bad way to get one of you daily servings of veggies. 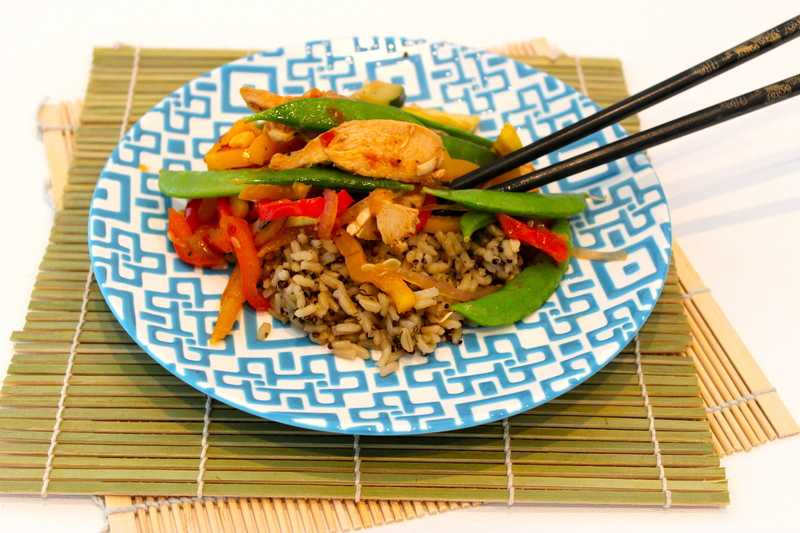 Summer Stir Fry & A Free Giveaway! I went to my favorite produce store called Produce Junction and was able to stock up on a lot of great veggies! I decided I would make a fresh summer stir fry that is so delicious and healthy–plus I had everything I needed right in my pantry. Bonus. 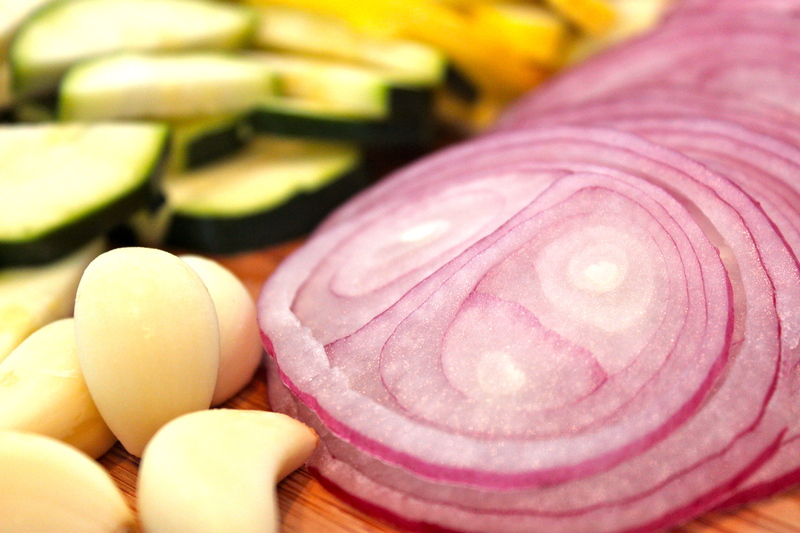 I did get a little carried away with taking photos of my veggies–but they were so beautiful I just had to share. Thanks to my mandolin, 90 second brown rice, and some precooked chicken I had in the fridge–dinner was ready from start to finish in less than 15 minutes. I also thought that this recipe was a great recipe to introduce a free giveaway open to US residents to reward my readers! This kitchen scale is pretty awesome! Not to mention really handy in the kitchen too–for example you can make sure each burger is the same size or each bread loaf is the same weight for equal cooking time or to start really monitoring your portion sizes. I was recently contacted by SlimKicker–a free healthy living app— that is a calorie tracker and interactive game based on your healthy choices. The purpose of the app is to turn your dietary habits and fitness goals into a level up game, where you earn points and rewards by tracking what you eat and completing challenges (an example challenge: giving up soda for a week or performing 20 squats a day). Once you achieve your goals and earn points from healthy eating, you are able to earn a reward you set for yourself. Each reward requires a certain number of points and thanks to the app, you’ll be reminded when to reward yourself. You are also able to connect with other people using the app to help motivate each other and join the same challenges. It’s an excellent way to motivate yourself and to keep track of your healthy choices. So, what do you have to do win the giveaway? Now on to the delicious recipe!